Almost permanent paint protection made easy! New Optimum Gloss-Coat Formula announced at SEMA 2015 is a high-tech polymer system that forms an additional layer of clear coat over a vehicle’s painted surfaces, plastic trim, bumpers, wheels, chrome and aluminum. Optimum Gloss-Coat was formulated to provide unrivaled resistance to etching caused by aggressive detergents, and swirls that are many times brought on during the car washing process. Vehicle surfaces that are coated with Optimum Gloss-Coat will be protected for up to 24 months. The All New Optimum Gloss-Coat formula is much like the clear coat that already exists on the vehicle, except it forms an invisible skin of protection that is much brilliant, sleeker, and less decumbent to wash-induced swirls and micro marring. Optimum Gloss-Coat creates a easy to clean finish that is considerably easier to maintain compared to traditional polishes, sealants and waxes. Optimum formulated Gloss-Coat is formulated so you can top it with a non-abrasive finishing wax like our Final Touch Ultra. 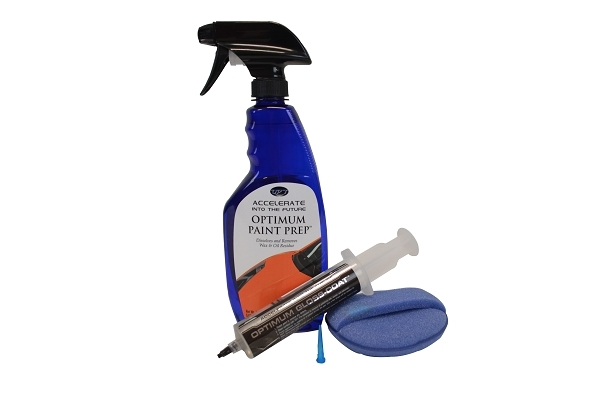 If you are planning on applying the Optimum Gloss Coat this kit will include either the 20cc or 10cc our Optimum Gloss Cote PLUS the Optimum Paint Prep. You actually save a few bucks ordering the kit versus purchasing both products individually.